New Model S-5 Weigh/Fill System. This unit is designed to run a free-flowing dry bulk product into any bag or rigid container, can do ounces up to 75 Lbs with an accuracy of 1 gram or .001 lb. All contact parts are Stainless Steel. Comes with a Programmable PLC with a foot pedal. The unit comes with a self-adjusting controller, automatic tare adjustment, self-adjusting bulk and dribble speed control. Comes with a Standard 250 Cubic Inch Supply Hopper. Spouts used in the filling process are dependant on the size of the container being filled and are priced separately. 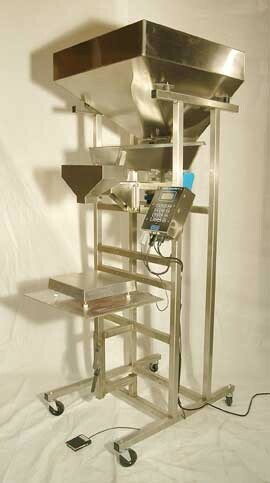 The frame of the Weigh/Fill System is Painted, Stainless Steel Chassis is optional. Overall Height: 67" x 24" wide x 28"deep. Electrics: 110Volts/1PH/60HZ, required air supply of 20 CFM. Delivery Timeframe: approx 2 Weeks.